Christmas is in a week!! Eeekkk! I am so excited, and so ready for it to be here…yet not ready at the same time. Does that even make sense? We are busy, busy, busy, yet are still recognizing those still, small moments where we are reminded of the true meaning of Christmas. Take this moment for example, when I captured my daughter sitting in from of our Christmas tree the other morning with our puppy dog. When I asked her what she was doing, she told me she was, “admiring an ornament.” I mean, how cute is that?!! This right here is what Christmas is all about <3. So while we have baked all of the traditional Christmas cookies, wrapped some presents, and drove around the neighborhood to look at Christmas lights, we still want to be intentional with how we celebrate and give joy this Christmas. And that means putting people over productivity, being willing to stop and have a conversation with someone even when we are in a rush, saying thank you to people in our community, or even just remembering to smile at people. It doesn’t take much to make someone’s day brighter, and these are the things I want to teach my children. So when I found myself wanting to thank a few people with some small gifts, yet we were out of our family Christmas cookies (already!!! ), I knew I had to get creative. What could I do that would be easy (i.e., wouldn’t take me all day), yet would still be thoughtful and loving? Because the saying is true, it’s not about the size of the gift, but rather the heart and thought behind it. The simple act of saying thank you can make all of the difference in the world. 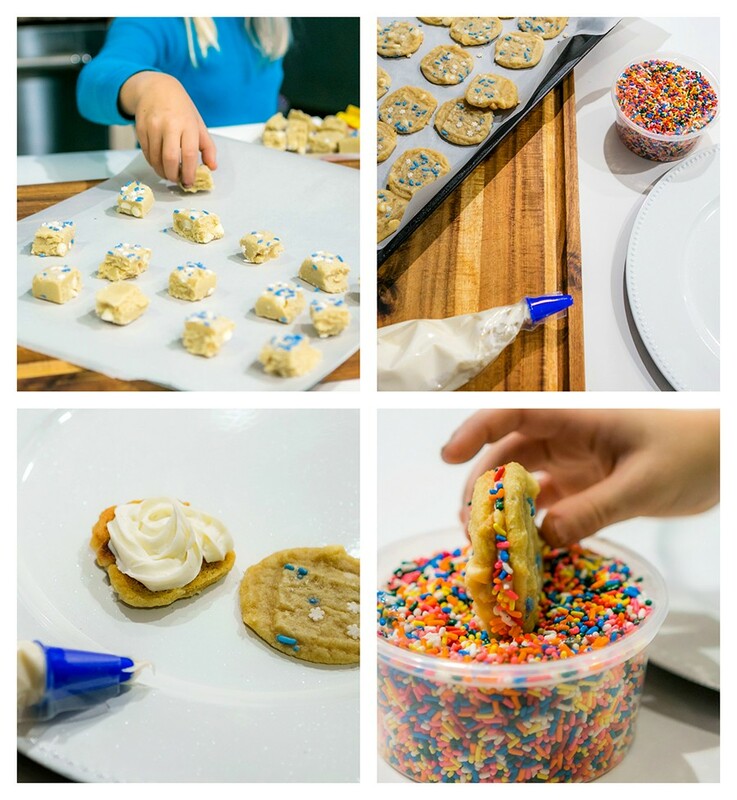 With just a little bit of thought and creativity, we were able to make handmade treats in under 5-10 minutes using items that we found at our local Food Lion. 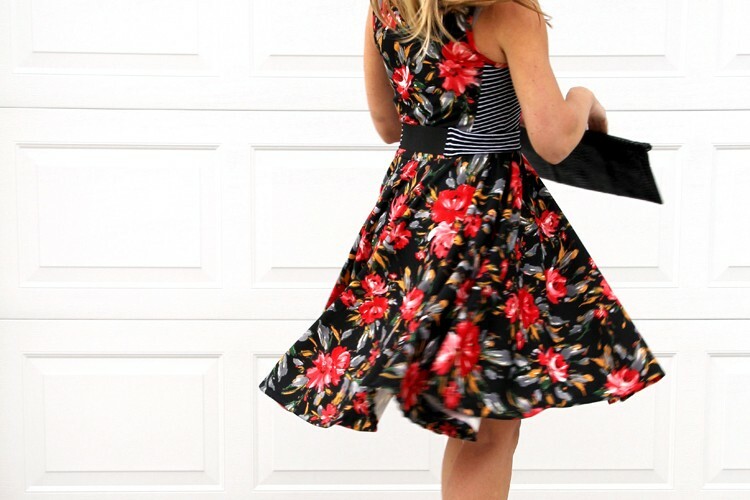 Many of the items we used are probably already on your weekly grocery list, or in your craft room. Place 3 powdered donuts on a lollipop stick or toothpick. 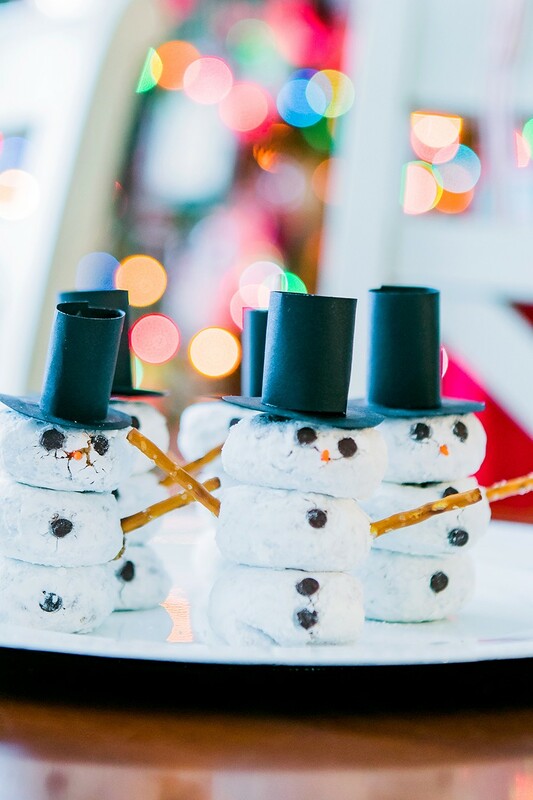 Push the mini chocolate chips into the powdered donuts to create the snowman buttons and eyes. *Optional – insert an orange sprinkle into the donut for the ‘carrot nose’. Insert pretzel sticks for snowman arms. Cut a circle out of construction paper about the same size as the width of your donut. 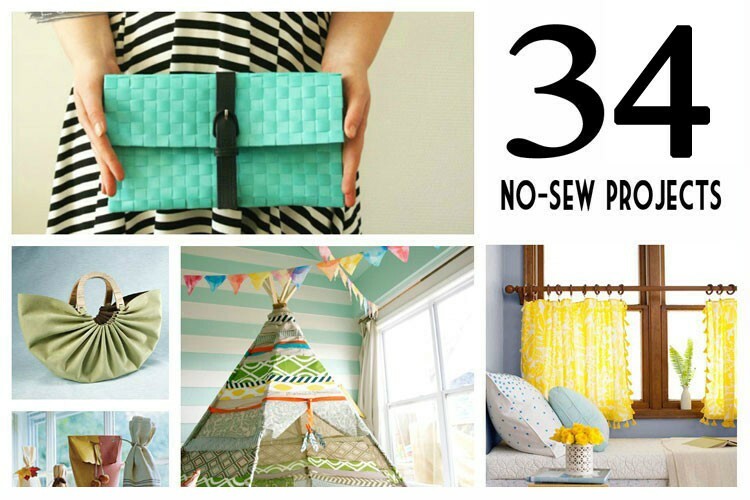 (This does not have to be perfect.) Using a pen, punch a small hole in the middle of the circle. Cut a long rectangle also out of the construction paper. Bring the ends of the rectangle together, creating a tube. Tape ends together. 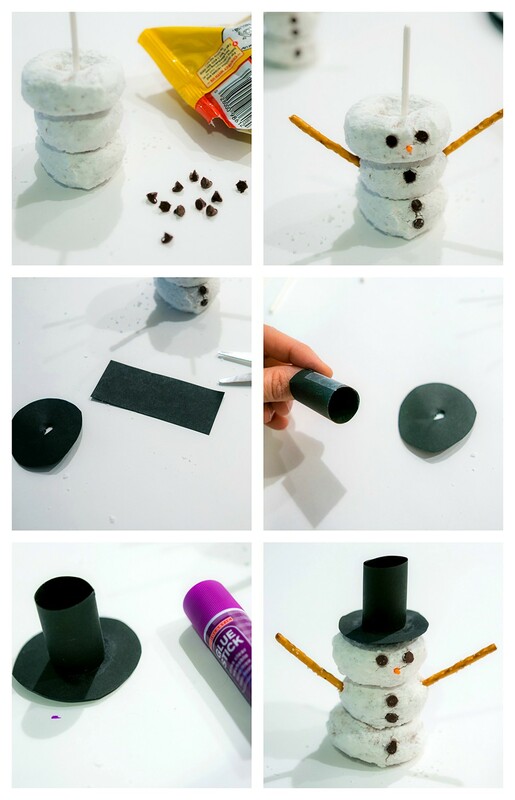 Using a glue stick, put a small amount of glue on the top of the circle and place the tube on top. Slip the hat on top of the snowman, and you are done! 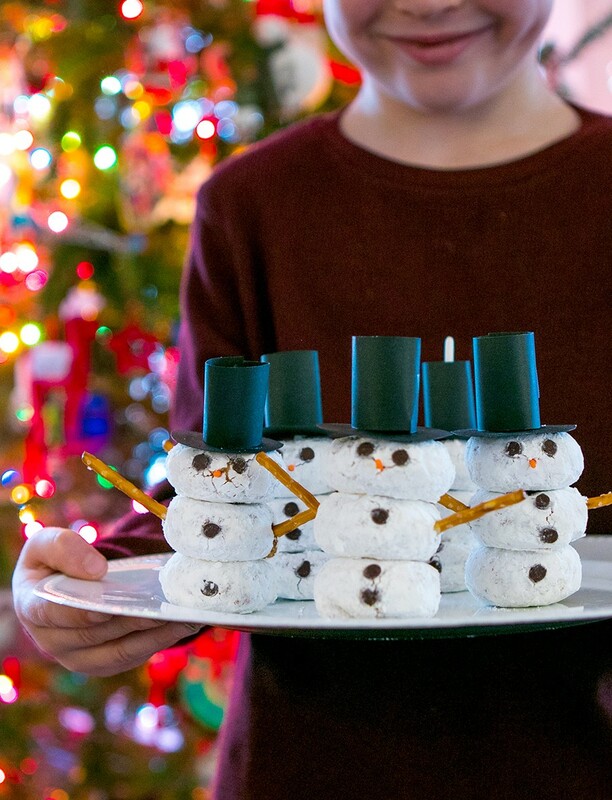 * One pack of mini powdered donuts made 5 or 6 snowmen. 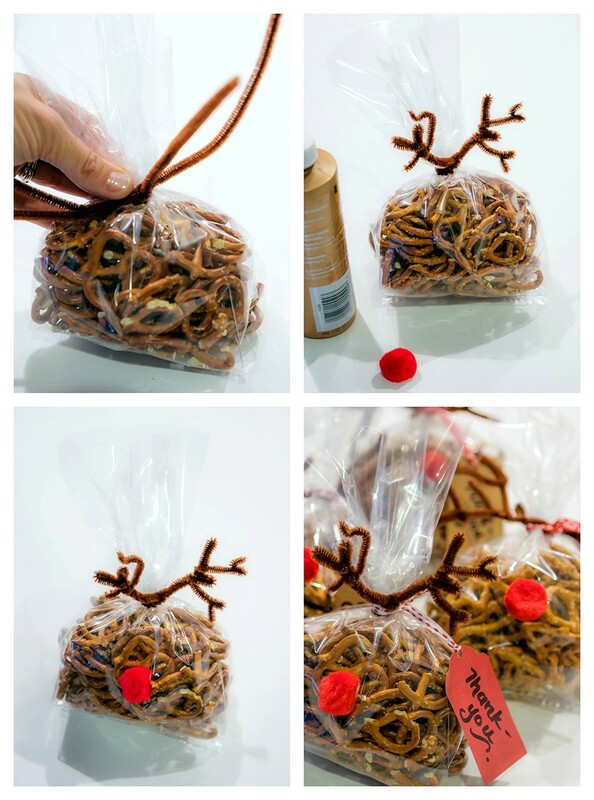 Fill bag 1/3 full with pretzels and tie closed with 2 pipe cleaners. Bend and twist the pipe cleaners to make ‘antlers’. 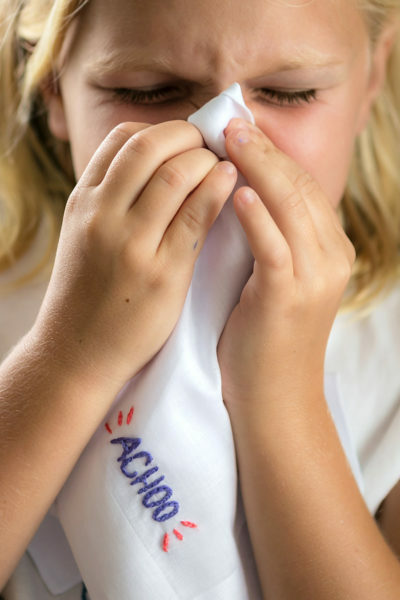 Use a small dab of glue on the back of a pom pom to add Rudolph’s ‘nose’ to the front of the bag. Add a small ‘thank you’ gift tag, and you are done! 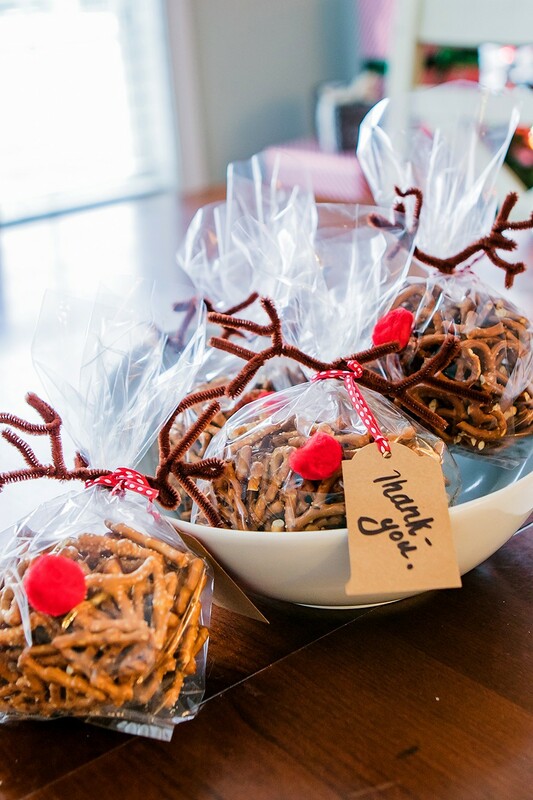 * One bag of pretzels made 4 gift bags. Allow cookies to cool completely, otherwise the frosting will melt. This is very important. Using the store bought frosting in the bag, put frosting on the back of one cookie. Sandwich with another cookie so that the top each cookie is facing out. Smoosh together so that the frosting reaches the edges of the cookie. 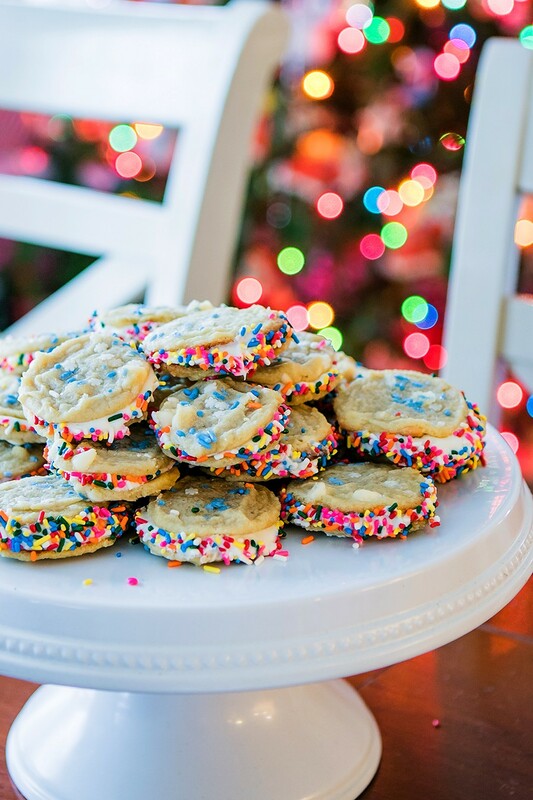 Roll the cookie sides in sprinkles, so that the sprinkles adhere to the frosting and enjoy! * One store bought sugar cookies made 12 sandwich cookies. We used 2 sugar cookie packets and 1 frosting bag, making 24 sandwich cookies in total. 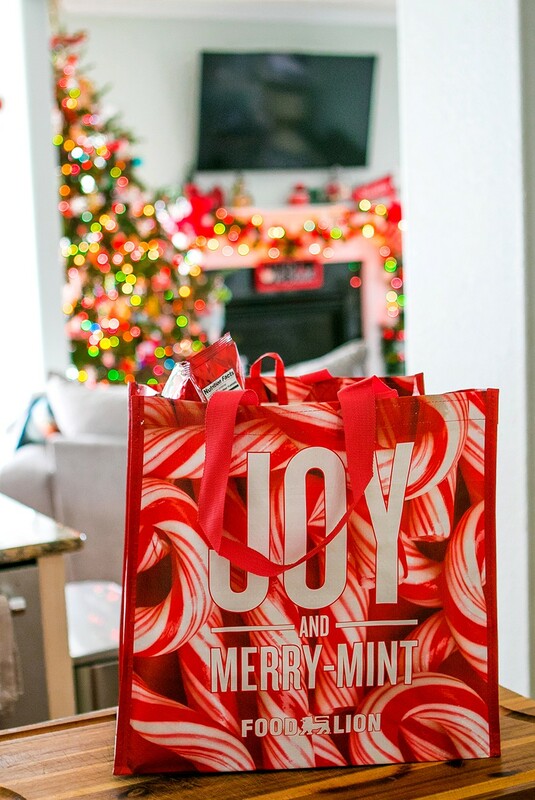 Food Lion helped me outsmart the season of busyness with fun, easy and affordable ideas that are sure to make people smile, allowing us to live intentionally with hearts of generosity and giving. Because when giving is this easy, everyone should do it! Click here For more tips on how to Outsmart the Season, and be sure to check out Food Lion’s weekly specials to get all of your much needed coupons this holiday season. Save with style this Christmas at Food Lion! Who are you making smile this Christmas, or who is making you smile?